PD2Go is our master class in professional development for literacy leaders, bringing together our best videos for professional development with the tools to use them with colleagues. Gigi McAllister gives a brief explanation of how her thinking on goal setting has changed, as well as the ways in which she uses student goals to connect with parents. Max Brand shares strategies for helping parents talk with students. 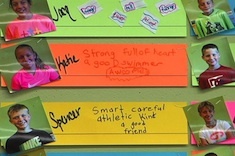 Katherine Sokolowski shares a wall display from her fifth graders that students build to celebrate who they are and people they love from home. The reading is from Suzy Kaback, explaining the value of an "All About Us" board in classrooms. Katherine Sokolowski scaffolds fifth graders Liam and Caden through the process of learning to recommend books to each other. The workshop includes reading from Tara Barnett and Kate Mills with suggestions for fostering better partnerships through student-created "want ads." Gigi McAllister helps a group of fourth graders evaluate questions for fostering good group discussions. Sean Moore leads his second graders in a whole-class discussion of nonfiction writing, including a partner share. In this minilesson, Katie DiCesare helps her first-grade students "envision" their writing drafts. The lesson focuses on creating mental images to conjure up stronger verbs and adjectives while writing. In this brief video from a reading share session in first grade, Katie DiCesare has three students describe strategies they used during reading workshop. Leslie Lloyd's third graders analyze literal and figurative language (which they describe as “nonliteral”) in Donald Graves's poem "Bully." Tammy Mulligan works with two seven-year-olds to teach them strategies for building reading stamina. 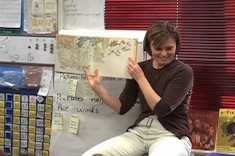 Beth Lawson shows how to get the most from a conference about series books in third grade. 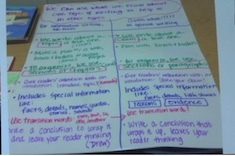 Inferring and synthesis are discussed, as well as the use of written notes for making meaning from texts. In this 12-minute video, Katie Doherty leads her sixth-grade students as they try the prompt "I am the one who . . ." during writing workshop. This is an excellent activity for building classroom community. Clare Landrigan leads a "quick and frequent" small group that integrates phonemic-awareness activities with assessment. 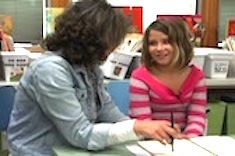 Mandy Robek demonstrates the strategies of teach, prompt, and reinforce when conferring with kindergartner Jeri.